None other than Thomas Jefferson dubbed Delaware the “Diamond State.” He thought of Delaware as a “jewel.” All these years later, Delaware is sometimes referred to as “Dela-Where?” Sure, it’s small and assuming, overshadowed as it is by New Jersey and Pennsylvania. But “downstate” has lovely and lively resort towns on the Atlantic Ocean and Delaware Bay. That adds up to a lot of waterfront property and some magnificent beach homes. 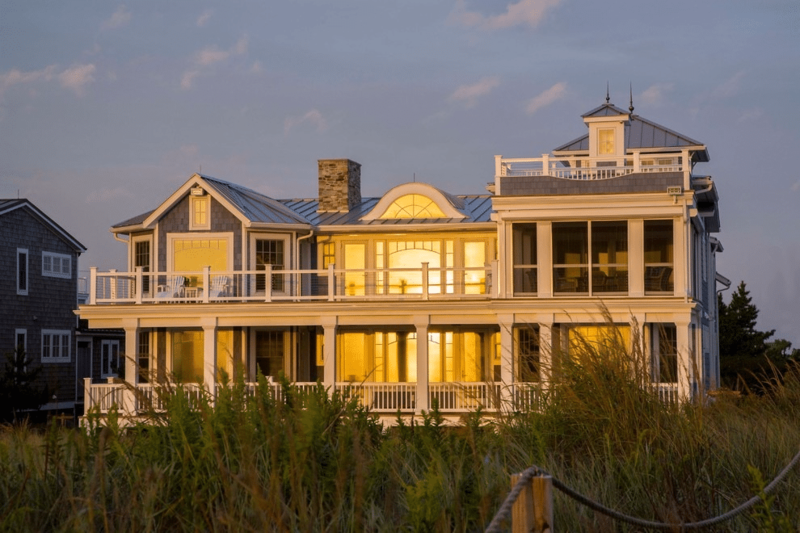 This house, for instance, that overlooks the ocean and an unblemished beach. 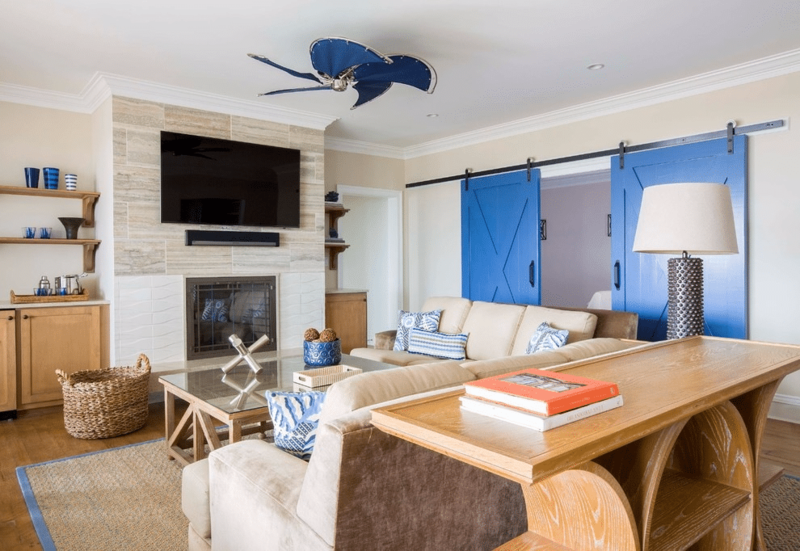 The sunroom brings inside the ambiance of the water, sky and beach with the blue of the upholstery and aged driftwood finishes of the coffee and dining tables. Notice the cadet blue shingles up near the ceiling. It’s wallpaper! We’ll see more of that as we go through the home. The room has pieces of that same blue here and there, in the stripes on the dining chairs, in the throw pillows, to pull the décor together. The use of white wicker for the “conversation set” and dining chairs is a bit vintage, a bit ultra-modern. The glass float encased in jute rope is a “just-right” note of green to add a welcome variety to the color scheme. The dining area is part of a huge great room. The table, chairs and sideboard are made from the latest “beach chic” wood—salt oak. The wood makes a nice bridge between the driftwood finishes in the sunroom to the more traditional wood that we’ll see in the living area. The blue stripes from the sunroom chairs is found here in the draperies and the hem of the draped dining chairs. This will be a continuing theme. The wall is softly mottled in shades of blue—enough mottling to add interest to the wall without drawing more attention that it warrants. The abstract painting’s bright colors also lend interest without trying to be the center of attention. The family room achieves a nice balance in both the color scheme and overall interior design: not as informal as the sunroom, less formal than the living area. The ceiling fan is made of brushed nickel with fabric blades that resemble somewhat sails. The block on the top of the fireplace and bottom white brick—as promised, it’s wallpaper. 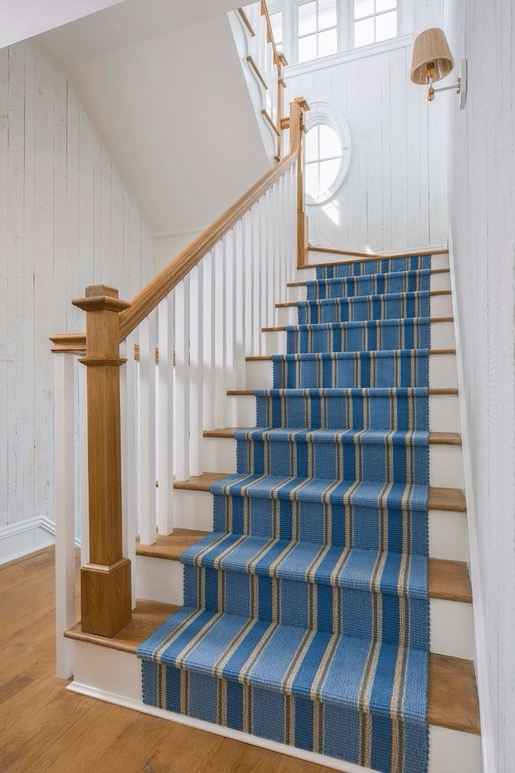 Here dark blue stripes are leading us upstairs past a porthole window on the landing. The walls of wooden planks? Wallpaper. The master bedroom brings the outside in through the three walls of windows and by keeping with the central color scheme. Stripes again in the draperies, but lighter and more subtle. Pendant lamps hang on either side of the bed providing reading light without the bulkiness of table lamps. The double-baffle gable vent over the large center window allows for a slight breeze to come in and that incomparable smell of the ocean, but has a fiberglass screen to keep out the beach gnats. This house gets my “Best Use of Stripes” award. I guess it’s been obvious that I’ve been utterly fascinated as I went from room to room. And not even a big fan of stripes. This house was renovated and redecorated all at one time. I think it would have been more difficult to maintain the color scheme and (hate to say it again) stripes theme otherwise. The decorator also gets extra-special high marks for the use of wallpaper that looks like building materials.